We use a simple methodology to test whether a set of atmospheric climate models with prescribed radiative forcings and ocean surface conditions can reproduce twentieth century climate variability. Globally, rapid land surface warming since the 1970s is reproduced by some models but others warm too slowly. In the tropics, air-sea coupling allows models to reproduce the Southern Oscillation but its strength varies between models. 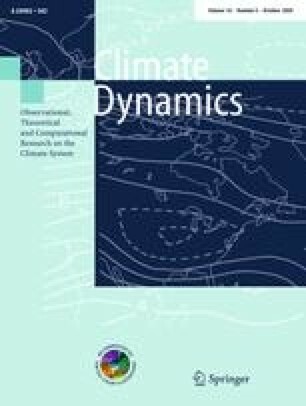 We find a strong relationship between the Southern Oscillation in global temperature and the rate of global warming, which could in principle be used to identify models with realistic climate sensitivity. This relationship and a weak response to ENSO suggests weak sensitivity to changes in sea surface temperature in some of the models used here. In the tropics, most models reproduce part of the observed Sahel drought. In the extratropics, models do not reproduce the observed increase in the North Atlantic Oscillation in response to forcings, through internal variability, or as a combination of both. This work contributes to the CLIVAR Climate of the twentieth Century project: http://www.iges.org/c20c/home.html and was carried out with support from the UK Met Office’s Hadley Centre climate research program: joint Defra and MoD Programme, (Defra) GA01101 (MoD) CBC/2B/0417 Annex C5. We thank Dr J. Murphy for useful comments and Drs B. Booth, M. Collins and G. Harris for coupled ocean atmosphere data from the Hadley Centre model and Dr D. Rowell for the Sahel rainfall data. J. Kinter and K. Jin were supported by research grants from NSF (0332910), NOAA (NA04OAR4310034) and NASA (NNG04GG46G). P.Sporyshev was supported by the Russian Foundation for Basic Research. S. Grainger was supported by the Australian Climate Change Science Program of the Australian Greenhouse Office. The development and maintenance of CCM SOCOL was funded by ETH Zurich grant PP-1/04-1.